The Yosemite Valley of Jack Burgess is as close as you can get to having a time machine that will transport you back to August of 1939. Jack is a stickler for historical accuracy not only as it relates to railroad equipment, but to life in general. Everything on this multi-level HO layout–the signs, the structures, the people and the automobiles–is stamped with authenticity. 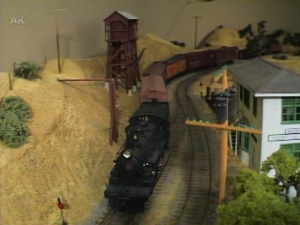 With this detailed knowledge, his structures and rolling stock are scratchbuilt to exact dimensions. The YV duplicates the passenger, logging and mining operations that made the railroad possible. The California Golden Hills are Jack’s specialty and he’ll show you how he gets the right look for his scenery. The Yosemite Valley is a Great Model Railroad because of Jack’s unswerving devotion to accuracy and high modeling standards. 59 minutes.